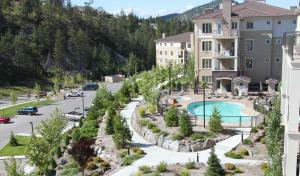 Click on the photo and see all the photos of Pinnacle Pointe Resort by Discover Kelowna Resort Accommodations. Golf course (within 3 km), BBQ facilities, Fitness centre, Hot tub, Outdoor pool (seasonal), Non-smoking rooms, Family rooms, Lift, Heating, Air conditioning. Featuring an on-site swimming pool and hot tub, Pinnacle Pointe Resort by Discover Kelowna Resort Accommodations is situated in Kelowna next to two 18-hole golf courses known at the Bear and Quail. Free WiFi is available throughout the resort. Each apartment offers cable TV, a deck or patio with a BBQ, and a full equipped kitchen. In-suite Laundry facilities are provided. The main bathroom and the ensuite bathroom include a hair dryer, towels, and soap. A fitness centre is available for guest use. Free parking for one vehicle is available. The resort is also conveniently located around 10 minutes' drive to the University of British Columbia (UBCO) campus, 5 minutes' drive to shopping amenities and Kelowna International Airport. Kelowna city centre is only 20 minutes' drive away. Late check ins after 19:00 will be subject to a CAD 50.00 late check in fee as additional staff will have to be kept after hours to cover this request. There will be no check in’s after 22:00. Please phone the property ahead of time to arrange check-in at 1873 Country Club Drive between 16:00 and 19:00. Only pre-registered pets are allowed on the property. Large dogs and cats are not allowed. Please note that the check-in and key-collection take place at: 100 - 1668 Ellis Street (Cnr of Ellis & Leon Streets), V1Y 0E1 Kelowna. Guests are required to show a photo identification and credit card upon check-in. Please note that all Special Requests are subject to availability and additional charges may apply. A damage deposit of CAD 1000 is required. You should be reimbursed on check-out. Please inform Pinnacle Pointe Resort by Discover Kelowna Resort Accommodations in advance of your expected arrival time. You can use the Special Requests box when booking, or contact the property directly with the contact details provided in your confirmation. This property is located in a residential area and guests are asked to refrain from excessive noise.